Satellite imagery shows a circulation moving north off of the eastern coast of Cuba. 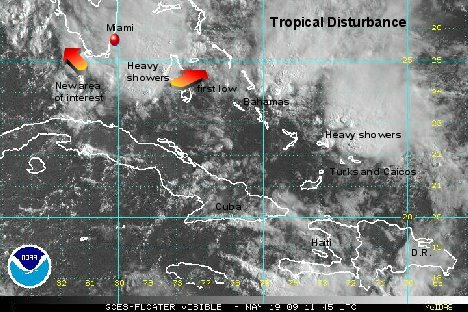 Showers extend from The Turks and Caicos northeastward to the central Bahamas. The circulation center is over the open waters southwest of Great Exuma by about 50 miles. Quickscat shows no surface circulation. Forecast models have hinted for several days now that some kind of disturbance would form and move northward toward Florida. The models are split with some taking the disturbance up the east coast of Florida, then westward over Florida into the Gulf of Mexico. Other models have the system developing farther west into the Gulf. A mid level high pressure center over the four corners will move through the Ohio Valley then into the Mid_Atlantic. This will steer the disturbance into the Gulf then toward the northern Gulf coast. This low is developing on the tail end of a cold front which most early season systems tend to do. It is too early to comment on development in the Gulf. Eastern Gulf water temperatures are marginal for development - 78-81 degrees. For Florida - with the surface high to the north over the Mid-Atlantic and the low over the Bahamas, a gradient wind will set up causing seas to increase from the east central Florida coast northward to the coast of Georgia. Some minor beach erosion may occur. Re: Is the Atlantic hurricane season trying to start early? A recon is scheduled for Tuesday if conditions warrant. 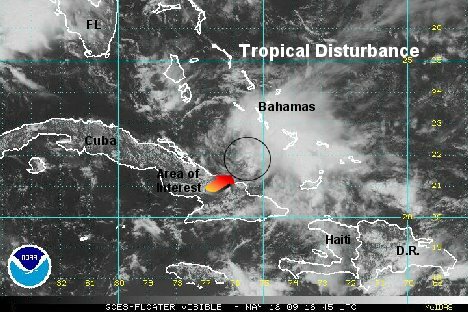 The disturbance is centered west of Great Exuma and has not shown any additional organization. Forecast models are in better agreement over the next few days. The trend is for a ill defined low to form somewhere between the Florida Keys and the southeast coast of Florida. 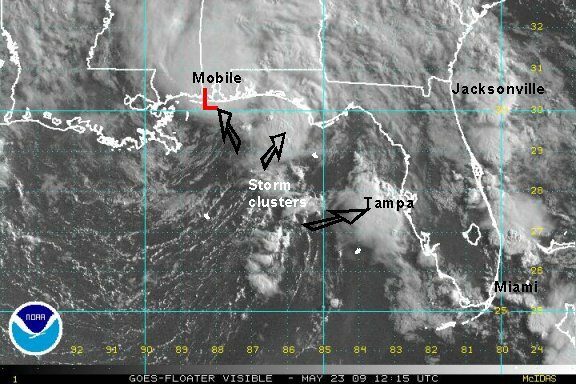 The low is expected to organize somewhat on the tail end of the front and move slowly into the east central Gulf. Models differ after this - some pulling the slightly better defined low toward the north central Gulf coast by later this week, others take it farther west and weaken it. Of immediate concern will be the east central Florida coast northward to the Georgia coast where minor beach erosion may occur in addition to heavy rainfall. The first visible satellite images show the low near the central Bahamas moving north and looking weaker. Another spin is now noticed south of Naples, off of the southwest Florida coast. Both lows are still disorganized. A band of very heavy rain is just east of the Gulf Stream east of Miami to the northwestern Bahamas. A survey of buoy data shows only weak winds of less than 20 mph with no noted surface circulations. The models are in better agreement. It appears that the upper low in the southeastern Gulf may induce a surface low in the same area over the next 24 hours. From there the low develops some toward the central Gulf then eventually toward the northern Gulf near Louisiana by late Sunday or Monday. At this time no model intensifies the low greatly. As mentioned earlier, water temperatures are marginal for development. Locally heavy rain will still affect the Florida peninsula for the next couple of days with some locations receiving 2-4" in more persistent bands. Forecast models continue to strengthen a low southwest of the Florida peninsula in a minimal fashion over the next few days. The low is predicted to generally move toward the northern Gulf by the end of the weekend. At this time, the greatest impact appears to be the Florida peninsula with several days of rain. Some minor beach erosion may be seen on the east central coast of Florida northward to the Georgia coast due to the gradient set up. The latest radar shows a large area of rain from the Big Bend southeast to near Orlando and into the Everglades. The heaviest rain is scattered northeast of Lake Okeechobee where Doppler estimates 2-4"+ of rainfall with rates of 1-1 1/2" per hour. A larger solid region of rain covers northeast Florida where rainfall rates were between 1/4" - 1/2' per hour. Satellite imagery shows our first low moving north with no additional strengthening noticed just south of the Abacos. Locally heavy rains are in clusters over the northwestern Bahamas to just east of the central Bahamas and north of the Turks and Caicos. The second low, which the models organize slowly is still south of Naples with minimal convection. There has been little change in the forecast models. The low is still expected to move west of Florida drifting into the central Gulf of Mexico over the next couple of days. By late this weekend it is predicted to weaken and move north toward the northern Gulf coast. The main threat still appears to be heavy rain over Florida. Recent radar shows a large band of solid rain heading from east to west across central Florida. Rainfall rates are in the 1/4"-1/2" per hour range - not frog strangling rates, but still a solid and steady band. Orlando and up and down the turnpike is where the current axis of solid rain is located. It should be in Tampa in a couple of hours. Our earlier estimates of rain will need to be bumped up. Some Doppler totals are not in the 6"+ range northwest of Daytona Beach. 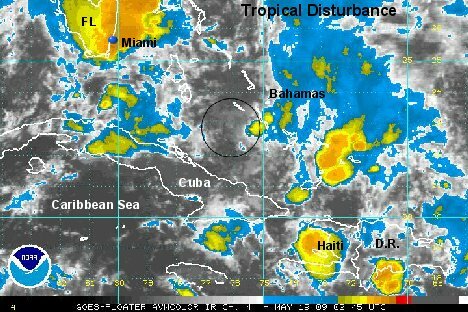 Satellite image confirms that the first low in the Bahamas is rapidly fading away. The area to watch is now centered about 75 miles west-southwest of Naples. There is little convection associated with the low at this time. 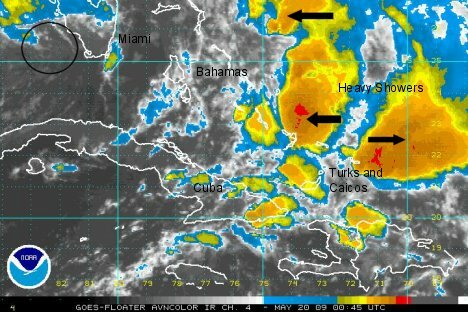 Heavy showers and storms are located mostly east of the Bahamas down to the Turks and Caicos. Forecast models are still consistent from yesterday. The low is now centered about 75 miles west southwest of Ft. Myers and appears to be drifting westward away from Florida. Locally heavy rain continues over north Florida. Radar indicates a solid region of rain from the Big Bend of Florida eastward to the 1st coast moving west. Rainfall rates are mostly between 1/4"to 1/2" per hour. Daytona Beach has officially reported just under 6" for the past 24 hours. Doppler radar estimates of 8-10" are located northwest of Daytona Beach. 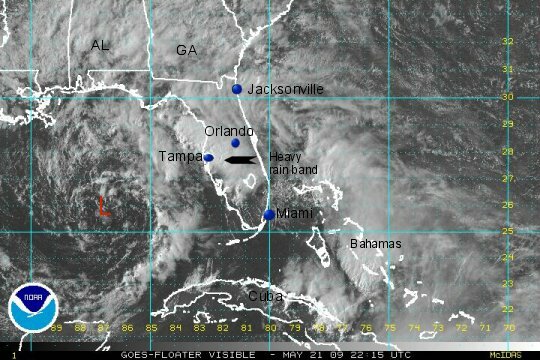 Satellite imagery shows the low centered west southwest Ft. Myers with some convection now on the southeast side. Nothing of great importance. The strongest convection is east of Florida and The Bahamas associated with a diffluent flow aloft. The low is now centered about 100 miles west of Ft. Myers and continues to drift westward. Very little convection is associated with the core circulation. The heaviest rains are now scattered from south of Orlando to Lake Okeechobee.Rainfall rates are in the 1-1 1/2" range with one cell in southwest Florida approaching 2" per hour. Lighter steady rain also remains across northeast Florida with rainfall rates are mostly near 1/4" hour. Doppler radar estimates of 12" are located northwest of Daytona Beach. A large area of 3-6" has been estimated from Orlando to Jacksonville. 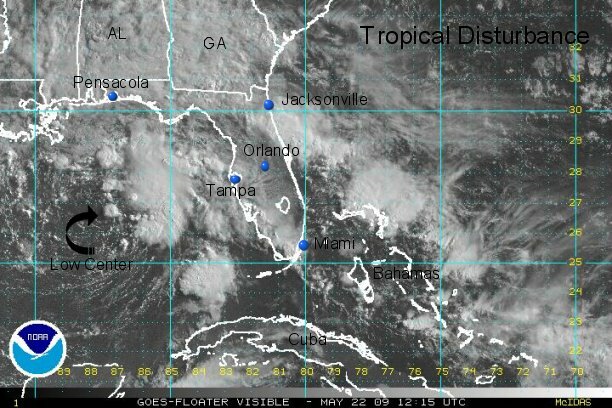 The disturbance is now centered 275 miles west southwest of Tampa moving west. There remains almost no convection around the center of circulation. Even though there is very little chance of development, the overall circulation continues to bring the effects of rain to Florida. The latest Doppler radar estimates indicate 10-15" of rain has fallen northwest of Daytona Beach - north to Palm Coast - and east of Ocala. Rainfall rates are on the order of 1/2"/hr in localized cells. The heaviest rain continues in scattered storms east of Ft. Lauderdale to Grand Bahama. Rainfall rates of 1-1 1/2"/hr are in these storms. The threat of additional flooding looms today with the large band of heavy rain near and just off of the Space Coast. This rain will likely move back into northeast Florida. Flood watches and warnings are in effect for the 1st and Space coast. Make sure you are extra careful if you live in a flood prone area. An additional 5"+ of rain will likely occur in locations already severely effected by the recent rain. The first visible satellite images show no convection with the surface low centered in the eastern Gulf. With no convection around the center of circulation, development at best would be very slow to occur. More heavy storms are north of Andros into the northwest Bahamas and east of Florida. Rainfall rates of 2"/hr are possible in these storms. 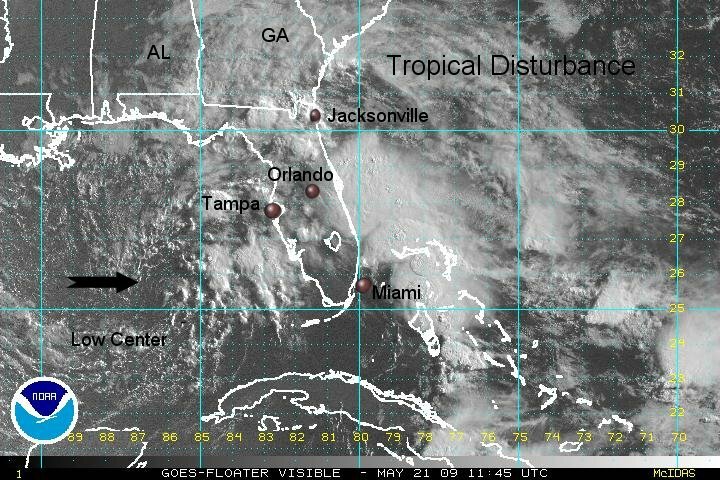 The disturbance is now about 300 miles southwest of Tampa and slowly moving west. Models show the low moving northward during the next 24 hours. It will meander off of the Louisiana coast Saturday before moving inland. Heavy rain has thankfully ended over most of northeast Florida. Rainfall amounts were in excess of 15" northwest of Daytona Beach. A new band has set up earlier today near and barely east of Tampa. Rainfall rates up to 3" per hour were seen about half way in between Ft. Myers and Lake Okeechobee. Radar estimates nearly 10" in isolated areas in this vicinity. The satellite imagery shows the low still nearly void of convection near the center of circulation. With this being the case, this will be the last update on this disturbance unless significant development occurs. Ok, we are still going to be updating this system. Overnight, the low has finally gained some convection near the center of circulation. There is now a large cluster of heavy showers and storms about 100 miles east of the center. The low is centered about 250 miles south of Pensacola and now has begun to move north. The models may be missing the mark. Three of our favorite models are taking the low inland on the Louisiana coast by tomorrow afternoon to Sunday morning. It appears that this may be too far west. 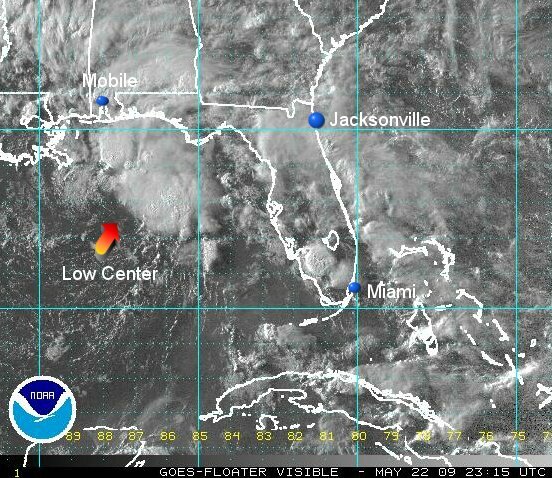 The low center may come inland over the Florida panhandle. Keep in mind, for weak tropical systems it is not as critical to where to low center moves inland. This may shift the heavy rain toward Tallahassee and the Big Bend in general. A new band of heavy rain on the order of 3/4"/hr is falling from north of Cape Canaveral to south of Jacksonville. Be on the alert for additional flooding in this region today. Rainfall totals are in excess of 15" northwest of Daytona Beach. The satellite imagery now shows convection on the east side of the center of circulation. We will be watching this closely today. There is still a chance for minimal development if storms can build around the circulation. The National Hurricane Center sent out a statement about ten minutes ago. Just like us, they are now taking interest of this system again. The heaviest rain is now over southern Alabama with only scattered storms over Florida and just northeast of the low circulation. The low is made up of several vorticies rotating around a broader low. The vorticity that we were following earlier today has moved north under the convection. The low will cross land later Saturday between northwest Florida and the Alabama coast. The models are still a little too far west, but are getting closer to being correct. NHC now says there is a chance that the low could become a tropical depression before landfall. There will be little difference in the effects to northwest Florida and the northern Gulf coast if it is declared a depression or not. Heavy rain will be the main threat. The heaviest rain is now near Dothan, Alabama. Rainfall rates are near 1/2"/hr. The tropical disturbance is now making landfall - so to speak on the southwest coast of Alabama at 8 am cdt. With this being the case, there is no chance of further development. A short summary of the tropical disturbance will be issued within the next 24 hours. The radar shows heavy rain with the core circulation on the Alabama coast. Rainfall rates of up to 1.5"/hr are occurring with doppler estimates over 3". Other areas of heavy rain are occurring just east of the Space coast of Florida and on the GA/SC coastal border. The first visible satellite images of the morning clearly showed the low moving onto the Alabama coast. Heavy shower and storm bands remain south of Destin and Panama City, west of Tampa, and east of Cape Canaveral. Additional flooding may occur with these bands if they move onshore. It is interesting to note that this system was just starting to organize just before landfall and may have been classified as the Atlantic's first tropical depression. Either way, the effects would not have been any different. 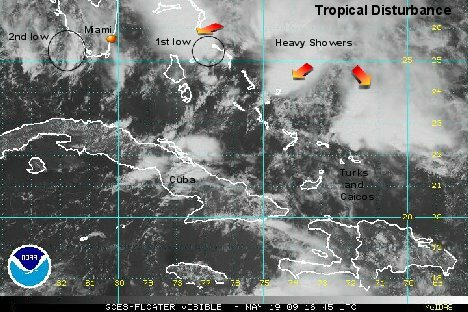 A tropical disturbance formed last Monday just north of northeastern Cuba. The disturbance drifted northward and faded away near the Abacos in the northern Bahamas. 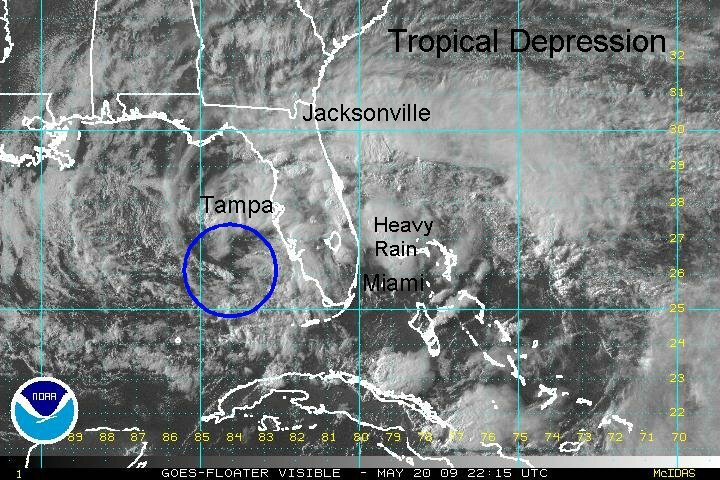 A few days later a new disturbance developed southwest of Naples, Florida in the larger circuation. This new disturbance moved west then turned northward on Friday night and by Saturday morning was on the southwest coast of Alabama. Soon after landfall it started to head northwest, toward a mid-latitude weather system. The forecast models started predicting some sort of tropical disturbance development about one week in advance. They had a little trouble at first trying to decide which system would be the dominate low. Later in the period, the models were too far west and keep taking the low into Louisiana. Even as the low had started moving north, they did not pick up on this trend. 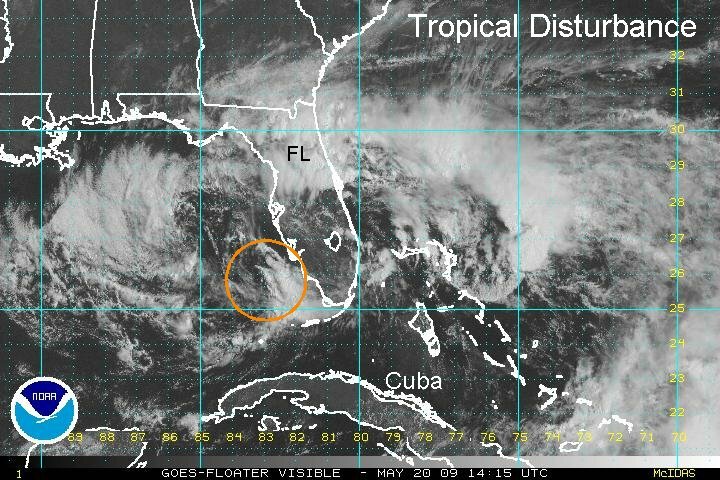 The legacy of this tropical disturbance - which could have been classified as the seasons first tropical depression just before landfall - will be the heavy rainfall brought to Florida. Rainfall totals of 15"+ were observed northwest of Daytona Beach, FL. A very large region of 3-6" fell across central and northeast Florida. Isolated amount of nearly 10" were observed in south Florida where a few bands set up.